Last year, FTD's 2 CD set Dixieland Delight was supposed to be released in cooperation with a multi-media box set with the same title by Praytome Publishing & Bud Glass Productions (including 2 books and a DVD). In fact, the box set was announced inside the cover of the CD album, but to this day there has been no trace of it. 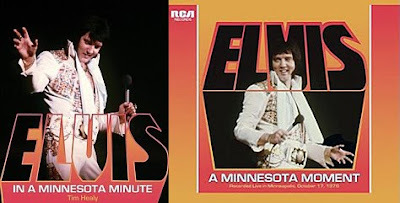 I was reminded of this when MRS announced a book called In A Minnesota Minute, to be released on exactly the same date as the upcoming FTD soundboard A Minnesota Moment, on February 15. Not only that, but the book contains photographs from the same concert as the one included on the CD, from October 17, 1976. Also, the photographs featured in the book are the work of Tim Healy, as is the photo gracing the cover on the CD set. And the layout of the book is very similiar to the one used on the CD set. But neither MRS nor FTD has said anything about this being done "in cooperation" as was the case with Dixieland Delight. So will this end just like Dixieland Delight, with only the FTD album becoming a reality? That doesn't seem to be the case, as sample images from the book are available. My guess is Ernst Jorgensen somehow got in touch with Tim Healy, offering to buy some photos he could use for the cover of A Minnesota Moment. Maybe Tim Healy then put forward the idea of doing a combo book/CD, like Live In L.A. When Ernst Jorgensen then told him, for whatever reason, that no plans for future combined FTD books and CD releases exist, Tim Healy looked elsewhere. Somehow he got in contact with the people running MRS, offering them the pictures, the result of that approach being In A Minnesota Minute. Other theories, anyone?